This Flickr photo at http://www.flickr.com/photos/eileensanda/5005855792 shows a flag which is described in a note as the flag of the Faroe Island Football Association (Fótbóltssamband Føroya - or FSF). The flag is white with the logo of the association over a steep stripe of light blue-red-light blue rising steeply from the bottom of the flag to the top. 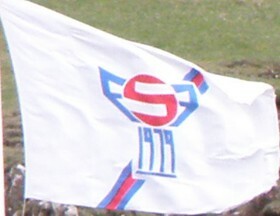 The logo consists of two Fs in light blue facing inwards on either side of a red S, above the year of foundation, 1979 in blue and underlined. Overall it forms the shape of a trophy cup and ball.